You know what the Sorting Hat says about your favorite house: “Or yet in wise old Ravenclaw, If you've a ready mind, Where those of wit and learning, Will always find their kind." Wow, that hat really knows how to rhyme! Hmm, we wonder...which house do you reckon claims good rhymers to its famed alumni? Probably Ravenclaw, Hogwarts’ home to all things witty. But you already knew that, didn’t you brainiac? Don the signature blue-and-black combo of this Adult Ravenclaw Robe and get ready to find your tribe tonight! While Rowena Ravenclaw said that, “Wit beyond measure is man’s greatest treasure,” and you couldn’t agree more (and you’ve even got the unofficial transcripts tucked in your robe to prove it), you also know that Ravenclaws can tend to be sort of eccentric (ahem, Luna Lovegood), so do not be afraid to allow your quirks to shine through, tonight, alongside your brilliance. 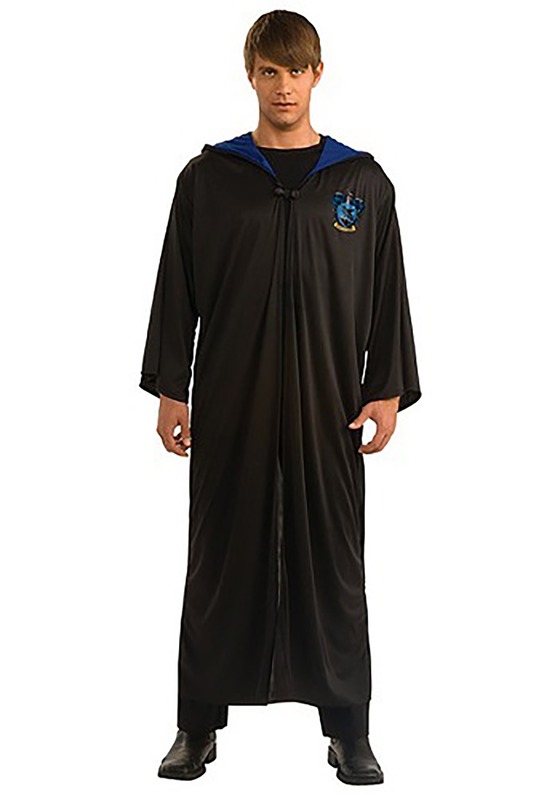 When you don this hooded robe and its Ravenclaw emblem and head out the Harry Potter theme party, we have an important job for you: make sure the shindig doesn’t turn into a bunch of Ravenclaws standing around trying to solve complicated riddles and competing over who got the most O.W.L.s, OK? Try to let loose a little bit, have some pumpkin juice and rest that mighty brain of yours. We’ll need it when the time comes to defend against He-Who-Must-Not-Be-Named. This was nice costume. It is just a hooded robe and front clasp. If you want to look the part you will also need a dress shirt, a wand and Raveclaw tie.